Interested in studying abroad but have questions about LGBTQIA+ topics in an international context? 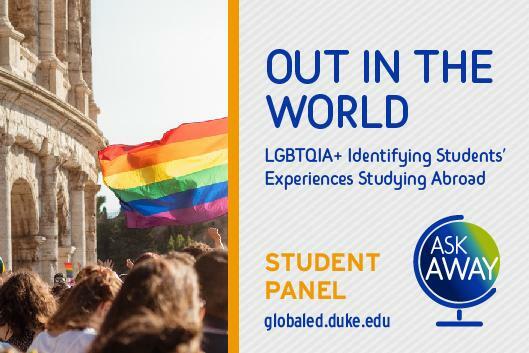 A panel of Duke students who have studied abroad will talk about their experience as an LGBTQIA+ identified person outside of the U.S. After the moderated discussion, panelists will answer your questions. The study away applications for Summer and Fall 2019 programs are open now, with deadlines fast approaching!